"In a land far, far away lies the Kingdom of Fiore, a small, peaceful nation of 17 million, and a place filled with magic. Found in every home, bought and sold in every marketplace. For most, magic is merely a tool, a mundane part of everyday life. For some, however, magic is an art, and they've devoted their lives to its practice. These are the wizards. Banded together into magical guilds, they ply their skills in search of fame and fortune. Many such guilds dot the landscape of Fiore. But there is a certain guild in a certain town that soars high above the rest, one from which countless legends have been born. A guild that will no doubt continue to create legends well into the future. Its name...is Fairy Tail." In a world teeming with magic, becoming a full-fledged wizardnote or mage, if you'd prefer, though it's officially translated as "wizard" requires you to join a guild. 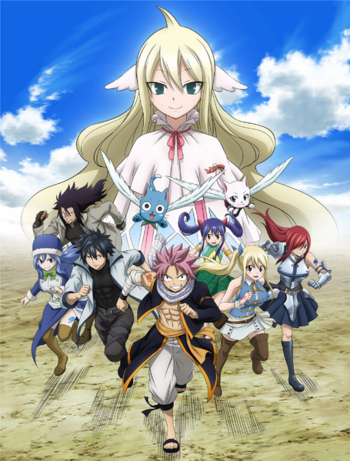 When Lucy Heartfilia, a 17-year-old aspiring wizard and novelist, meets a boy named Natsu Dragneel, who also happens to be the well-known wizard Salamander, he invites her to join one of the most colorful and notorious guilds in the kingdom: Fairy Tail. Their adventures continue as they perform missions for the self-titled guild, struggle with problems from the past, fight world-threatening villains, and learn The Power of Friendship. Written by Hiro Mashima of Rave Master fame and first published by Kodansha in 2006, Fairy Tail consists of 63 manga volumes, proving itself among the more successful long-running shonen series. The manga was adapted into an anime produced by A-1 Pictures and Satelight and directed by Shinji Ishihira in 2009, with two English dubs produced by Funimation and Animax. The show was put on hiatus in March 2013, totaling 175 episodes (not including OVA episodes), but was eventually relaunched April 2014 with Bridge replacing Satelight. The continuation itself would end upon reaching its 102nd episodenote bringing the total to 277, until it was picked back up for a final, 51-episode season in October 2018note for a grand total of 328 episodes. Licensed episodes are available to watch on Hulu and on Youtube . Natsu, Lucy, and friends appear in the Massive Multiplayer Crossover game, Sunday VS Magazine: Shuuketsu! Choujou Daikessen. The series also has a podcast here and a wiki here . Not to be confused with the Fairy Tale genre (the author has stated since the beginning that the spelling of the name is intentional). The series ended in July 2017 with a total of 545 chapters, collected in 63 volumes. Despite the series reaching its conclusion, an official sequel manga launched nearly a year later titled Fairy Tail: 100 Years Quest, with storyboards by Mashima and the finalized art done by Atsuo Ueda. As for Mashima himself, he moved on to create Edens Zero, a Spiritual Successor that continues the same themes and contains a few Expies of familiar Fairy Tail characters, just as Fairy Tail has done with Rave Master before it. See the Franchise Page for more information about the associated media. Please move any character tropes to the proper character page and any arc-specific tropes to the recap page.